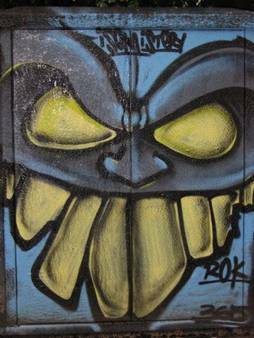 Sometimes graffiti is an improvement, such as this blue monster who decorates an ugly electric panel box in the park at Place du Commerce. 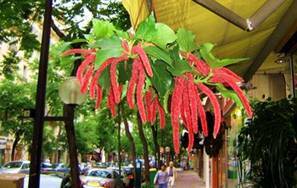 Chenille plant hanging on the avenue Felix Faure. 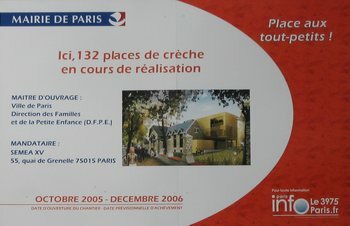 A historic building that housed a nursery (avenue Félix Faure) has been demolished, except for its façade, which is going to be part of a new nursery building, as the sign below explains. Room for all the little ones! 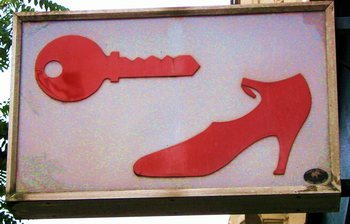 In Paris, the place where you have your shoes repaired is also where you have keys made. And keys are very expensive here. A couple evenings ago we had dinner with our friends who are also Nico’s staff (see the cat featured on July 3rd). We went to the brasserie Le Suffren, at the corner of La Motte Picquet and avenue de Suffren. Tom and I had not been there for eight years because of corrupt service (i.e., waiter telling us that we should tip 20 percent when we knew darned well the service was already included in the tab). This time we simply had very bad service. Food was mediocre. But the company was great. Our friends will be moving back to California soon, and we will miss them very much. Regular beef isn’t so good in Europe, and I have been eating nothing but fish and chicken so far, so yesterday I was really in the mood for some good veal. 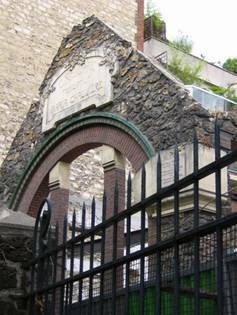 So we went out last night for a long walk down the avenue Felix Faure and when we came back up to the rue du Commerce, we stopped for dinner at Della Piazza. I realize that we have been going to this nice Italian resto for nine years now. The food is excellent, sauces are superb, service is cheerful, and the value is good. So what if it isn’t French food. Note the plastic film still covering the seats. This is all brand new. 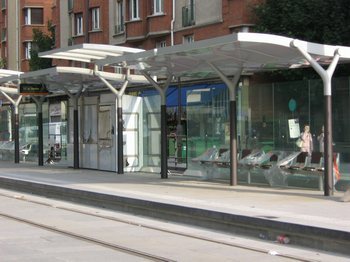 The French are so very good at public transportation. 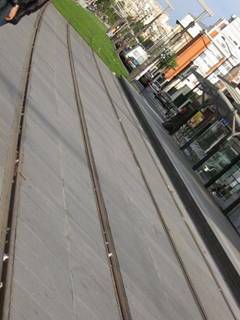 To celebrate the tramway’s almost completion, yesterday there was an organized walk (“randonnée”) along its route. Public art in the form of large modern sculptures is also being added along the way. The Tour de France isn’t getting so much attention this year because it is overshadowed by the World Cup, which will end tomorrow when France plays against Italy. I think the fact that 23 Tour de France riders were disqualified for blood doping also has detracted from that race. At any rate, the World Cup is The Number One story in France, eating up pages and pages of newspaper coverage. Interior Minister Nicolas Sarkozy continues to be embarrassed by the reaction to his plan to deport illegal immigrant youth. Now a high-level bureaucrat has announced that thousands of illegal immigrant families who have a kid in school will suddenly be “regularized” and will be given the documents they need to call themselves legal! Just to get on AFP’s nerves, I’m giving you this link to the AFP story on this subject here.